What can one say, finally, about a film in which Mark-Paul Gosselaar of “Saved By The Bell” fame actually gives a more commanding performance than co-star Robert De Niro of Robert De Niro fame? I understand that the comparison may evoke something in the way of a “you’ve got to see it to believe it” challenge, but I’m not offering any refunds on your ticket purchase to “Heist” should you choose to act on that incorrect interpretation. Directed by Scott Mann from a screenplay and story by Max Adams and Stephen Cyrus Sepher (the latter is also an actor, and has a role in the film; I don’t know what it says about Sepher that he wrote what turns out to be a pretty much completely nothing part for himself, but it is odd), “Heist” begins nastily, with Morris Chestnut and De Niro playing gangsterish fellows indulging in some sadistic torture. The scene is credibly nasty. Overplayed, in fact, in the tradition of contemporary cheapie crime movies that feel obligated to tell the viewer right away that they mean business, and the business isn’t going to be pleasant. Now I know crime doesn’t pay, but I also remember that crime movies can be fun. This gets off on a sodden foot right away, and that’s not even the worst of it. Things soon quiet down, with a dark-haired young woman waiting for a bus in the quiet late evening; her sit is intercut with frantic views of two men in masks running furiously, accompanied by loud music and sound effects that announce that something INTENSE is GOING DOWN AGAIN. One isn’t ten minutes in, and the movie has sapped one’s will to live. Which is kind of too bad. There’s actually a not-too bad caper plot underneath the incoherent over-direction from Mann. Jeffrey Dean Morgan, who, given his efforts here and in the recently-unceremoniously-dumped-into-theaters mess “Shanghai,” maybe deserves the sobriquet “Hardest Working Man For What Turns Out To Be No Good Reason In Show Business,” plays a dealer on an Alabama casino boat who can’t pay for his beloved daughter’s operation. (“Operation for what?” you ask. Are you really asking? They never really say, honest. It’s that kind of movie.) 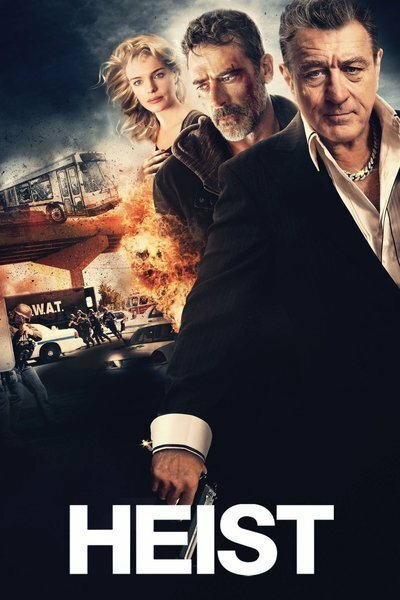 So he goes to his boss, De Niro’s Frank Pope (nicknamed, yes, “The Pope”) for a favor, is rudely turned down, and so assents to co-worker Dave Bautista, who acts just like a pro wrestler and has an idea about knocking off the place and taking out some dirty, dirty money. Of course things go wrong, and even very wrong—this sort of thing happens when you’re working from a plan that was sketched out in salt (literally) on a diner table—and the action gets woolier and wilder (a bus hijacking! The bus is running out of gas! Several SWAT teams show up! Black-clad figures on motorcycles too!) the plot gets thicker (De Niro’s mean casino owner may be dying and he has a socially-conscious adult daughter who hates his corrupt guts and corrupt money! The 7 p.m. deadline for surgery payment looms hard!) and the cast gets more motley (the “Saved By The Bell” fellow pops in as a cocky police detective, while Gina Carano plays a patrol car cop with a heart of gold but line readings of wood). I’m making it sound better than it is. What it is is noisy, noisome, bloody, obnoxious, and more. Mann completely muffs material that, if given a rewrite by David Mamet and then even directed by him, could have been as good a movie as David Mamet’s own, um ... “Heist,” which had its problems but didn’t pound you into a state in which you actually envy migraine sufferers.